A Heart Shaped Wreath Made From Things in Your Yard! Almost any kind of twigs or branches can be used to make a decorative wreath. 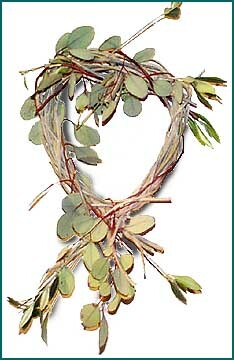 This wreath is made of new growth from our olive and eucalyptus trees. I trimmed off the newest and most pliable branches long enough to form the basic heart shape, and then filled in the wreath with shorter branches and twigs. Take one long, very pliable branch and bend in the middle. If the branch is green enough, it won't snap. Continue folding the ends around and cross them at the bottom of the heart shape. Tie the ends together where they cross with a short piece of floral wire. Wrap and twine the rest of your branches around this main shape. Use floral wire where needed to hold the branches in place. Use branches without leaves for the main bulk of the wreath, but as you get closer to the outside, include some small branches with leaves left on them. Eucalyptus branches are wonderful to use for this project. The new growth branches are reddish in color, great for a Valentine's Day wreath, and they smell great too!